DST may be waiting for the all-female spinoff of Spider-Man: Into the Spider-verse to revisit Spider-Woman. She may be in a completely different look in the movie but if Series 77 is the de facto tie-in to Far From Home, a future comic-based series could be a tie-in to this spinoff. 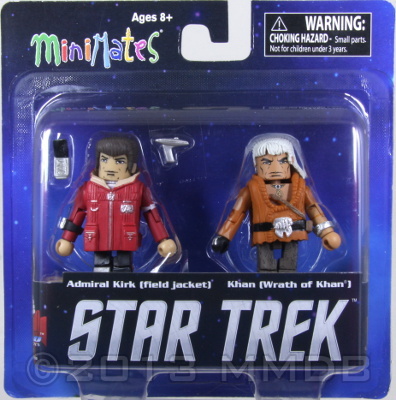 DST loves to do totally different looks for de facto movie tie-ins. Look at Star Trek Into Darkness. 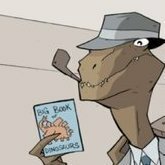 I'd wager DST will redo the classic, iconic suit if only because it doesn't mean paying for another license. I'd really love to see Shocker get an update. I just got the original again and I love it, but I like the Superior Foes look of his costume. Not that I particularly want one but I'm surprised Jessica Drew Spider-Woman hasn't been updated at some point. I think the world would be a better place with a fully bulked up Captain Britain figure. If ever there was 'a picture that told a story' then those photos say it all about Captain Britain . One set I've always thought was a no-brainer is the West Coast Avengers. 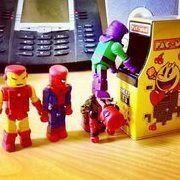 This would allow for three updates: Hawkeye, Iron Man, and Wonder Man. 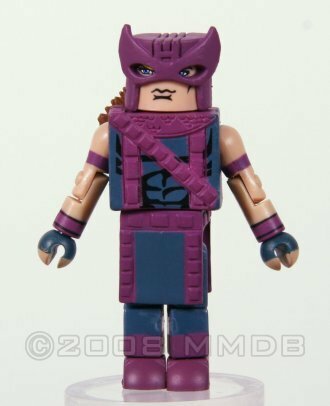 Hawkeye's an easy one, since he wore long sleeves in that book but otherwise his costume is the same, so no new parts. There's two options for Iron Man: a redo of the Silver Centurian armor, or, perhaps more interstingly, Jim Rhodes as Iron Man (Rhodey was still Iron Man in the original WCA mini series, replaced by Tony in the regular book). I know we just got the classic armor again with the hologram head, but getting a Rhodey version would be pretty cool. And for Wonder Man, they can either update the previous two figures, or even make his notoriously ugly red and green costume (which I kinda like). For the last slot, it pretty obviously goes to Mockingbird, since Tigra was just released. The box set would allow enough room to include extra parts to make all her main looks in the series (short and long hair, bare legs/blue boots and covered legs/white boots). Unfortunately, DST seems to have moved past these types of team-specific box sets, so I doubt it's going to happen. I'd be all over the West Coast Avengers. 👍 Gimme dat Mockingbird. The WCA actually sounds fantastic. How about those four figures versus the Wrecking Crew! I would like to see that mask return. Not a fan of the mask the past 2 variants have used. I’d love a classic West Coast Avengers set! I wouldn’t even mind a re-do of the Silver Centurion Iron Man if they’d make the shoulder pads a separate movable piece. Mockingbird with long and short sleeve parts would be great! Maybe throw in a classic Vision with solid/phasing arms and legs? Or a nice new villain? Mockingbird with the crazy sleeves would be fun to see. They might just give her those awful Storm/Shadowcat sleeves! 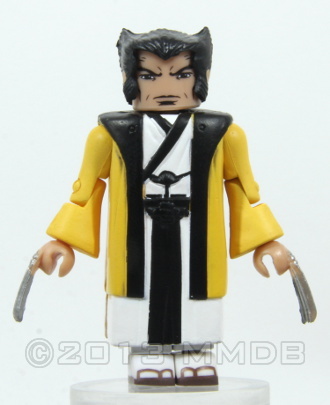 I think the Samurai Wolverine/Lady Deathstrike sleeves would make more sense. I’d love to see classic Mockingbird, but it’d be hard to have the parts for both pants/hair down and no pants/hair up looks if they were completely accurate. The Heroes Return/Best Of Hawkeye mask isn’t perfect, but I think it’s the best option. The Fear Itself mask is a good sculpt, but I’m not a fan of Hawkeye having “Batman eyes”. No it's not. It's one extra pair of legs and boots, and one extra hairpiece (presuming the face is a tampo rather than a sculpted mask a la Marvel Girl). 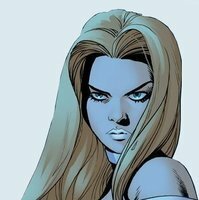 I swear, the things you guys don't know about Mockingbird! Wow, didn't expect Mockingbird to bring out such strong feelings. Or maybe everyone's just really into fashion. The pattern on the torso of the two costumes is different too, so all you could share would be hands, arms, hips, and head. It'd be easy to just overlook, but that's why I said completely accurate. And I think at least the second look would need a sculpted mask.